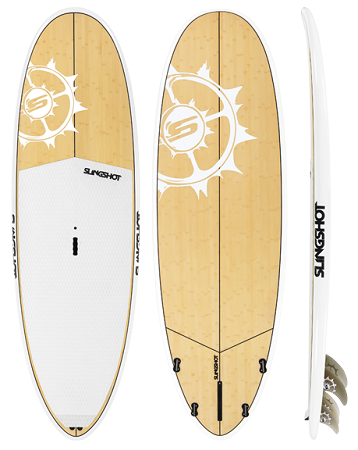 > Slingshot Space Pickle 8'6" / 9'4"
Slingshot Space Pickle 8'6" / 9'4"
It may have the same name as last year but the board shapes have changed and new sizes are now available. The new Slingshot Space Pickle will SUP surf, wake SUP and flat-water SUP. Its unique wide tail is now much more pulled in allowing a quicker release off the top of a wave. And with its kicked up nose there will be no nose pearling when you are late into your turn. The board is flat under foot then progresses to an aggressive “V” spine. The flatness under foot allows the board to track straight but the “V” spine allows you to carve rail to rail when you want to. Whatever size you choose you can catch waves early, shred behind a boat or hit the flat-water. 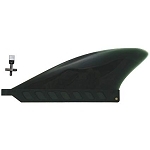 PADDLER PROFILESurf oriented paddlers looking for a stable performance surfboard that you can thrash in the ocean, kill it behind the boat and that will also track well on flat-water. Releases the tail, increasing the rocker at the rail line. This displacement effect allows for smooth carving turns. Added bite enables tighter transitions. Comfortable, high density traction material with uniform support. Manually open and close vent plug to allow your board to ‘breath’, equalizing internal and external pressure from heat and atmospheric pressure changes. Added safety and security in the surf.